She's Fantastic: DC Collectibles WONDER GIRL! Wonder Woman's niece makes her New52 action figure debut in this new figure from DC Collectibles. Cassandra Sandsmark was never related to Wonder Woman until her (and Diana's) history was rewritten in the New52. Before that she was a young girl who found some artifacts that gave her superpowers. 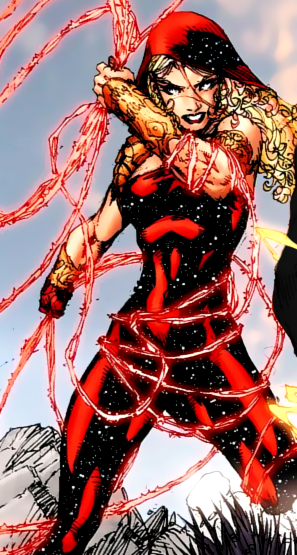 In the New52 she was introduced in a very similar way with a pair of powerful bracelets giving her powers. Soon, however, it was revealed that her father was a demigod of Zeus - now officially tying her to Diana. This action figure is pretty great. There is some really creative use of plastics that really makes her pop. Cassandra's torso and legs are cast in a translucent dark red plastic with layers of gold glitter embedded in it. These layers of glitter in the translucent plastic create a very cool effect when you move her around. Her skin is cast in the semi-translucent fleshtone plastic that we saw with the Brightest Day ladies and the Arkham City Catwoman. It looks decent, but somehow creates a blurry effect and makes her features look less defined. Overall though, she's a total catch. Let's check out Cassie Below! The sculpt by Karen Palinko is gorgeous. I feel like we haven't seen much from her lately, so it was a welcome surprise to see her name on the side of the box. I love how the glittery design of her costume is reminiscent of Donna Troy's starry costume. Her lasso is made of a really flexible rubber. I could probably pull it around her legs so she could hold it, but I'm afraid it will rip. Right out of the box, the lasso doesn't want to lay naturally on her hips, but I think over time it will relax and drape nicely. Wonder Girl's articulation is very good. She has a ball-jointed neck (somewhat hindered by her somewhat-flexible hair), Hinge and Swivel shoulders, Swivel biceps and forearms, Hinge knees, elbows, and ankles, Swivel boot cuts, and Hinge and Swivel hips. I suppose the lack of any torso articulation is due to the transparent plastic. It's really hard to capture the cool effect the layered glitter gives. Here are a few images of Cassie from the New 52 Teen Titans comics. Here she is with the DC Direct Wonder Girl from 2004. And here she is with another recent DC Collectibles lady, the Crime Syndicate's Superwoman. When I first saw this design, in fact a lot of the New 52, it makes my eyes bleed. But your pictures make her look quite nice. And as you, I am a sucker for translucent. 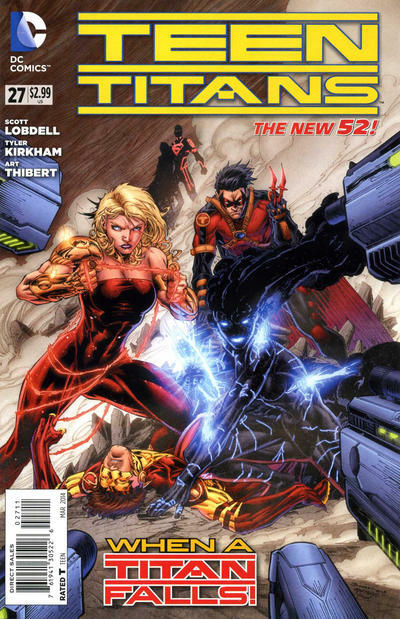 I thought most New52 redesigns were awful when I first saw them, but i was actually okay with all the Teen Titans. It was insteresting to see Cassie in a proper costume for once and I liked how reminiscent it was of all the previous Wonder Girls. My comic shop has two of this figure and the faces looked COMPLETELY different. They both looked good, but between the face paint and the placement of the hairpiece, they looked like different people. Wow. fantastic photography really sold this figure to me. I have to get her now. Do they make the Robin with the wings yet. I must research. Appreciate the review! How did you get this figure so early? Oh and you sold me on the figure. Thanks! She came out on April 29th in comic stores. Originally the first three Teen Titans were solicited for May 2014, but they shipped a little early. I don't get any freebie advance figures ...yet ;) Glad you liked the review! Thanks man! Looking forward to picking it up! How's the sculpt on Superboy and KF? They both look really good. Although I didn't buy them. At a $25 price point I have to pick and choose and DC collectibles is putting out a TON of amazing stuff this year.